IRVING, Texas (AP) Missouri quarterback James Franklin remembers exactly what happened the only time he faced Oklahoma State when the two teams were still Big 12 rivals two years ago. "We lost and I had three picks, two of them were tipped, one perfectly into a defensive lineman’s hands," Franklin said. "But I did make the tackle." Franklin gets another chance against the Cowboys in his final college game. The No. 9 Tigers (11-2), the Southeastern Conference East champions in their second season in the league, play No. 13 Oklahoma State (10-2) in the Cotton Bowl on Friday night. A year after Texas A&M completed its first SEC season with a win over Oklahoma at the Dallas Cowboys’ massive stadium, there is another Big 12 reunion in the Cotton Bowl. Missouri plays the border-state rival that also used to be in the Big Eight Conference, and the first Big 12 team it has faced since switching leagues. "It definitely brings a little bit more to the rivalry, them leaving the Big 12 and playing them again," Oklahoma State linebacker Caleb Lavey said. "You definitely feel the rivalry there." Oklahoma State won the last three meetings in the series, including that 45-24 victory on the road in October 2011. Franklin was 14 of 27 passing for 184 yards, a touchdown and the three interceptions, along with a 31-yard catch, while current Mizzou running back Henry Josey ran for 138 yards on 25 carries. The Tigers left the Big 12 for the SEC a few months later, and had their first losing season (5-7) in eight years in their first year in the new league. They won only two conference games in 2012. Picked this preseason to finish sixth in the seven-team SEC East, their only losses were in double overtime to No. 8 South Carolina and in the SEC Championship Game against No. 2 Auburn. 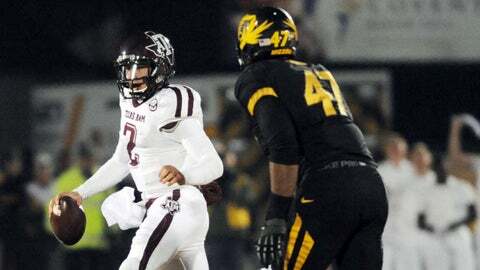 They can become only the second 12-win team at Missouri with a victory in the Cotton Bowl. "We’re having a great year, but I think to win this bowl game would basically put the stamp on what this team has done for Mizzou," receiver L’Damian Washington said. "It just proved Mizzou can compete in the SEC. Last year people said Mizzou had no business going to the SEC, and this year to win the SEC East in our second year, that says something." SEC teams have won nine of the last 10 Cotton Bowls, all over Big 12 teams. The lone exception was in 2008, when Missouri, then in the Big 12, beat Arkansas 38-7 to cap its only 12-win season. "It’s pretty cool being able to play against them," Franklin said. "We have a little chip on our shoulder, and I’m sure they do too since we were in the Big 12, and now we’ve left. I think it’s going to be really exciting." Oklahoma State cornerback Justin Gilbert said the Tigers seem to be playing a lot harder as a team in the SEC, while still balanced on offense and defense. Cowboys linebacker Shawn Lewis, who had one of the interceptions in 2011, admits that it "does add a little flair to the situation" with Missouri having come from the Big 12 and now having success in the SEC. "We have a bunch of these guys, all my seniors were playing, and their guys were playing, Franklin and Josey and the senior offensive line, they were all sophomores. They were pretty good on offense, and we were pretty good on defense," Oklahoma State defensive coordinator Glenn Spencer said. "I think it’s a good dynamic of this game, from that side of the ball, and my side of the ball. We’ve all gotten better. Let’s see what happens."